Spring has finally arrived. Several days of warm weather have brought out the dandelions, weeping willows, the first maples and I noticed one strawberry flower in front of the hive. Good amount of activity at the entrance. Bees were bringing back bright orange pollen. 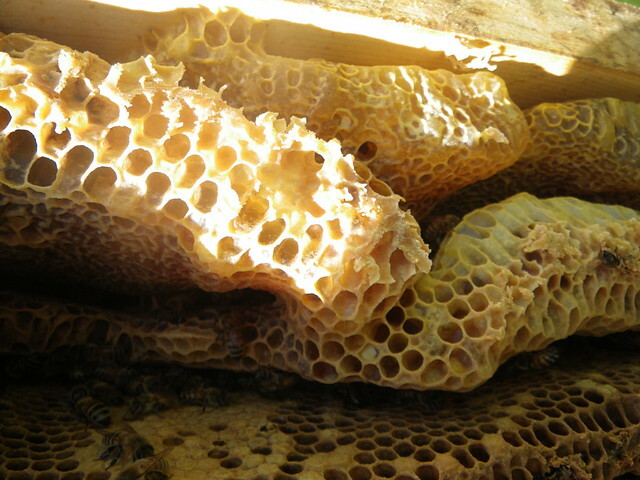 A closer look above the hive entrance showed signs of bee poo. This was here before we took the winter solar wrap off. Bees were venturing between the box and the wrap to do their business. It seems like a small amount and hasn't increased since the last visit so I won't worry too much about it. 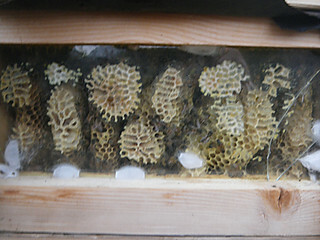 A strong buzz of disaproval as we removed the top box, but the colony displayed its typically placid nature for the remainder of the inspection. 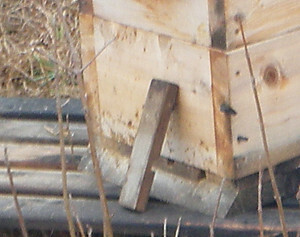 The top box contained two combs of capped honey and at least a few frames with some capped brood. 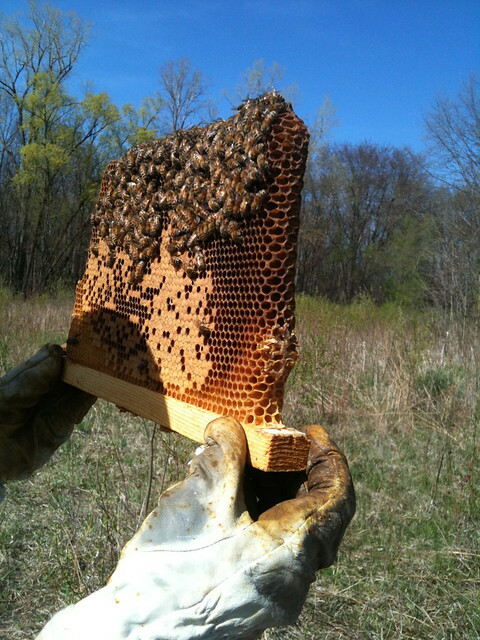 The middle box also had a couple combs of honey, and at least 4-5 combs with plenty of capped brood, eggs, larvae. 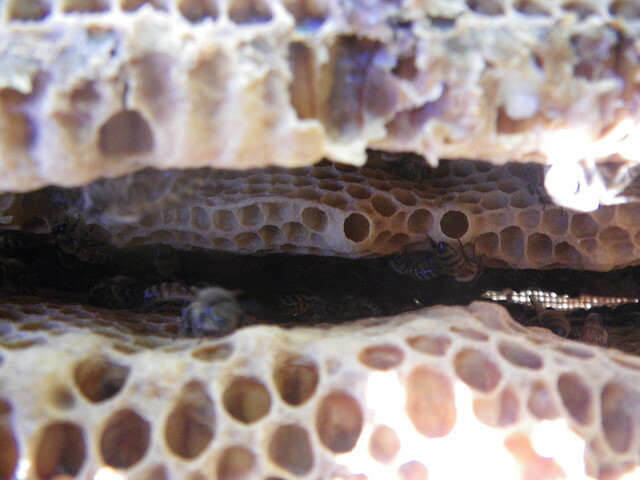 There were gaps here and there in the capped brood, which were all full with nectar, pollen or eggs. We did spot some some odd critters nestled around one top bar. They seem to have moulted out of a stripped 'skin', which doesn't look quite like what we'd expect from wax moth or small hive beetle. 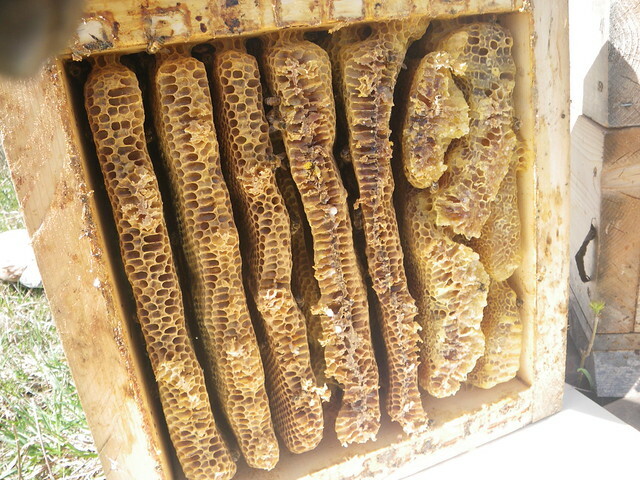 The bottom box didn't seem to have much going on other than small amounts of pollen in the comb I removed. The bottom board was full of all kinds of the expected things after winter. There were a few more dead bees than shown in the photo, but it seems they must have been able to clear out many bodies themselves through the long narrow entrance reducer I used. They seem to be building up steadily and should really get going in the next week or two as the small apple orchard on the other side of the field comes into bloom. 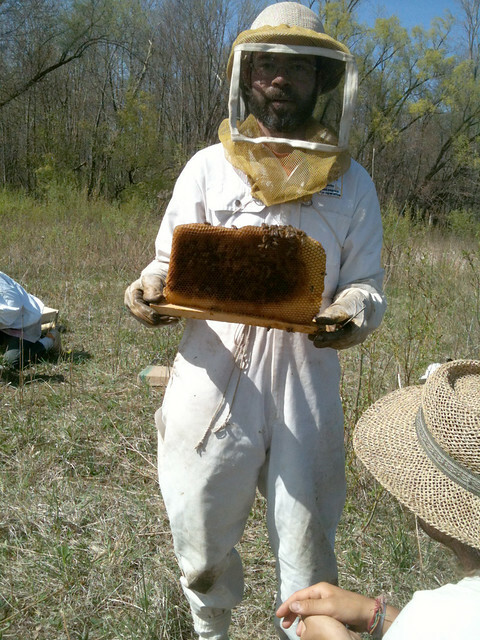 Today was our first opportunity to see our bees since last October. We also wanted to move them out to a new location. 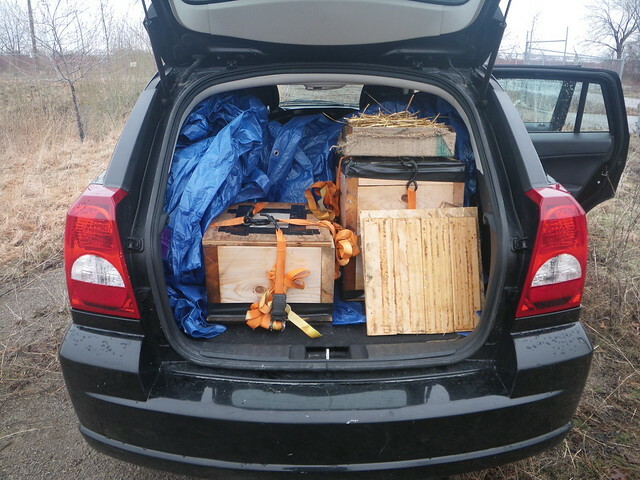 We'd been borrowing space from a generous beekeeper friend while we secured a location of our own. I didn't hear any buzzing through the thick walls, but a look in the observation widow in the top box showed bees running around out of cluster despite the cool and wet weather. The high for the day was 7 degrees celcius. Hooray they survived! The hive still had a fairly reasonable weight, the bottom box was light, and though I could lift the top two boxes on my own, it was not with great ease. Most, but not all, of what little comb I caught a peak of, had been uncapped. With cool temptrature and rain in the forcast for weeks it does make me wonder if they will need extra food before the flowers start to flow. Next we prepared the move. 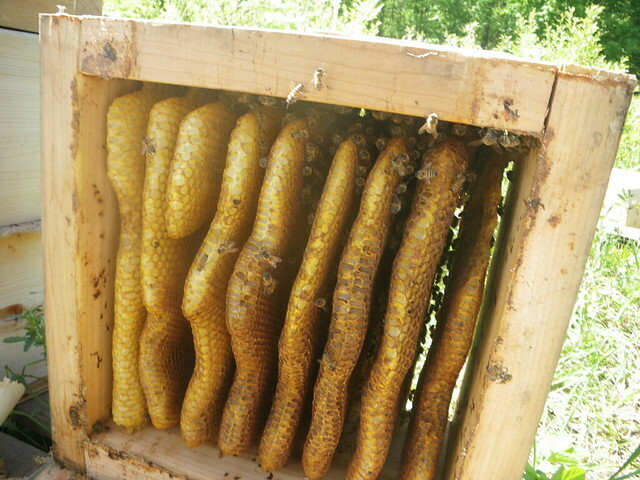 We ran a wire between the first and second box to separate the comb and quickly placed screened boards between them. 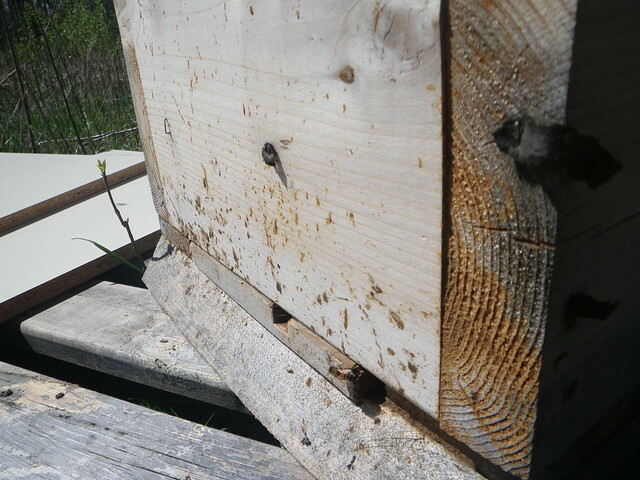 A few bees came out from the bottom box to show their disapproval with this intrusion. A little different than the calm relaxed disposition they displayed all the previous summer. 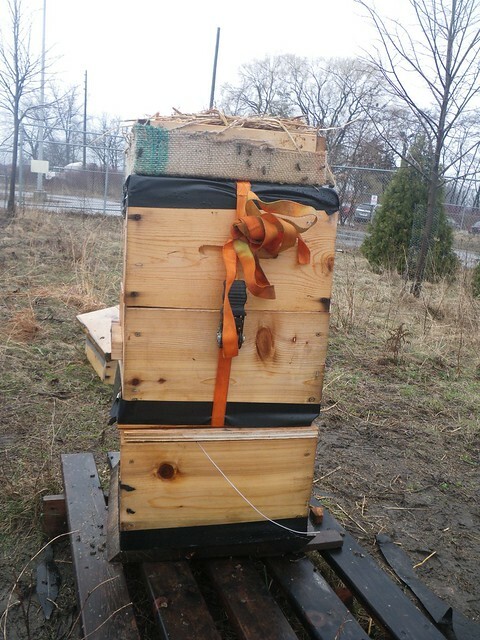 Another screened board on top, duct tape to seal any gaps and then we used ratchet straps to keep the different hive sections tight together. 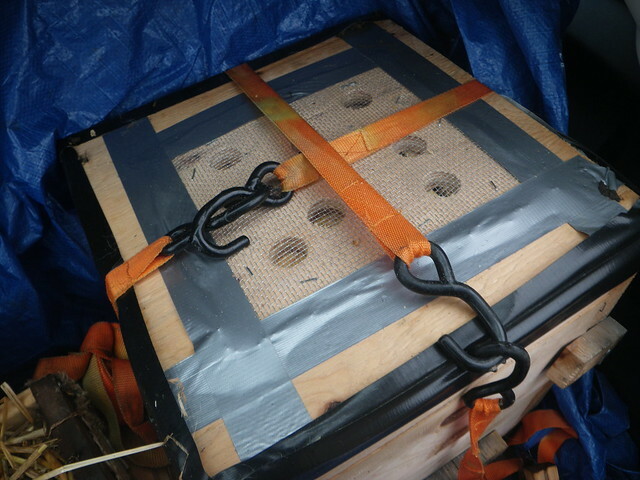 We loaded them into the back with combs facing parallel the wheels, and slightly propped up the two box stack with the vent board on the bottom for a little extra ventilation for the bees. For some reason the bottom box had many more concerned bees coming up to the vent holes. Perhaps there were more bees in that box? Maybe the queen was in the other boxes and they were more distressed? 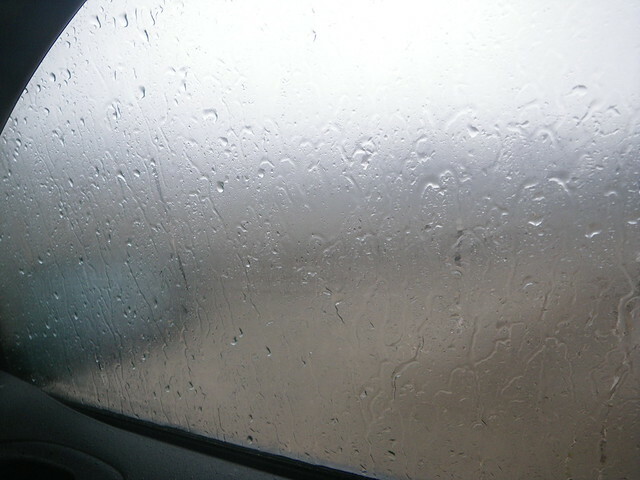 Just as we were ready to unload a heavy downpour commenced. Our car subsequently got stuck in the muddy road. 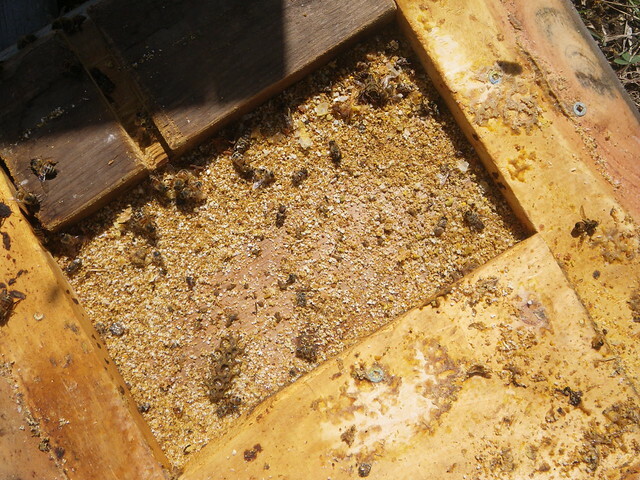 Bees tend to be in the hive on days like this, but there are certainly drawbacks to hive work on rainy days. Sun is certainly our preference. We mistakenly rotated the orientation of the top two boxed in regards to the bottom box 180 degrees. 🙁 hope that doesn't confuse them too much. We took out the entrance reducer and tried to scrape out the bottom board. The number of dead bees didn't appear to be excessive. We did observe a fair number of mites in the debris. The classic, and still the most definitive text on the subject is 'Swarming Its Control and Prevention' by L. E. Snelgrove. Snelgrove's recommended approach to swarm prevention involves keeping lots of space in the brood box for the queen to lay. 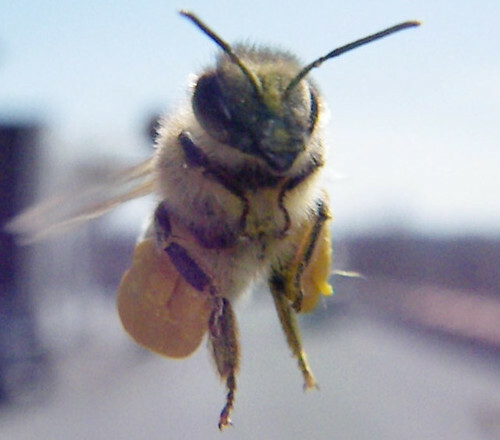 Once queen cells are observed, his strategy involves separating the flying bees from the house bees. 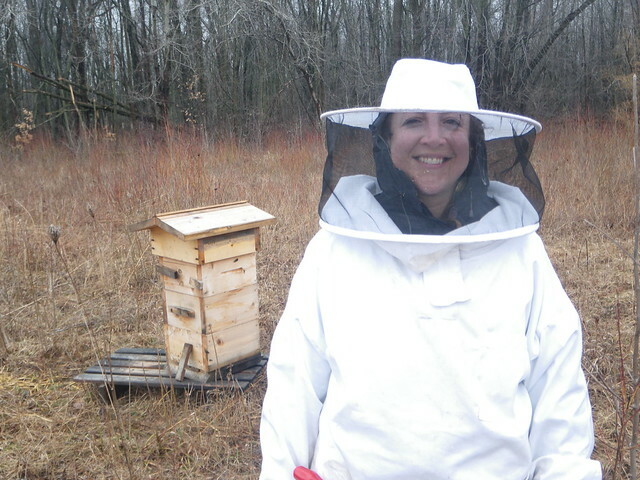 To achieve this separation, he designed what is now called the Snelgrove board, a simple yet clever piece of equipment that allows you to divide bees within the same hive. The result of using a Snelgrove board is basically an artificial swarm or split, however, his approach allows for a little more flexibility, particularly if increases are not desired and you plan on recombining the split later. On the downside, you do need to spend a little time opening and closing entrances a few different times over the course of a number of days. 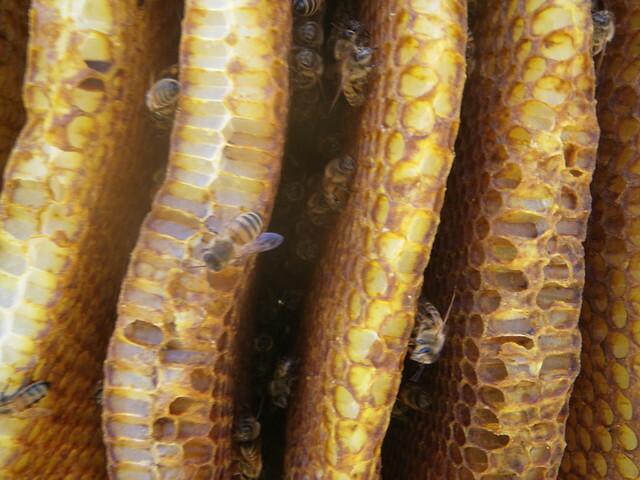 If you don't want to bother with Snelgrove's particular technique you will still benefit from reading his book as it is provides a comprehensive look at honeybee reproduction behaviour, and how beekeeper interventions can alter their behaviour. In addition to his own method, the 112 page book also provides the authors opinion on the pros and cons of other swarm control approaches. Caution. Those tempted to avert swarming by the destruction of queen cells should pay special attention to the comments on pg. 57 of Snelgrove's book. 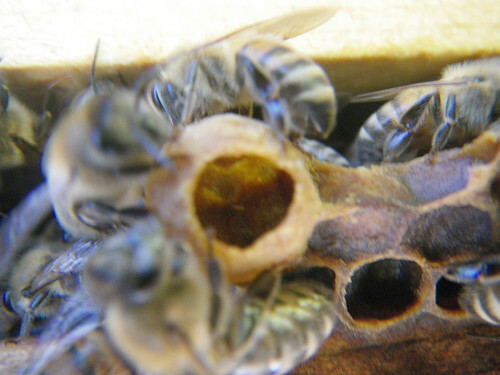 He observed that after queen cells are destroyed one may find new capped queen cells as soon as four days later since the bees may use existing young worker larvae to replace the damaged cells. 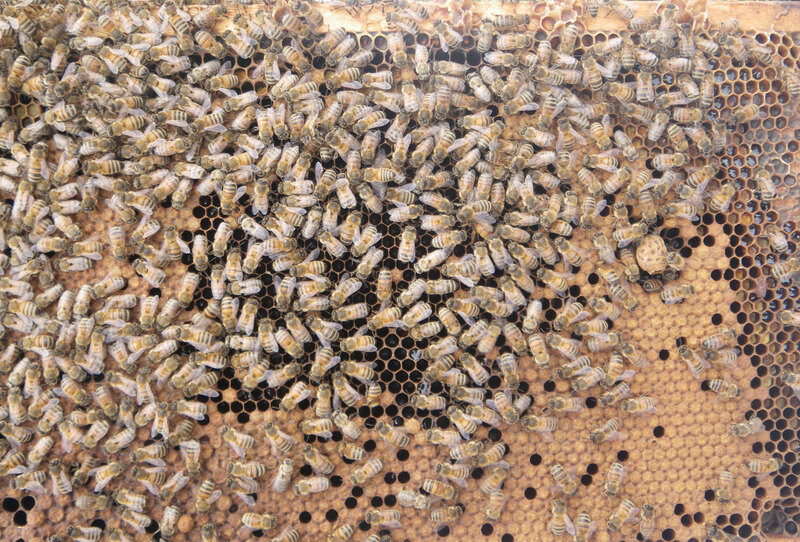 This blog post on swarm prevention by Michael Bush is another quick and simple explanation of the behaviour leading up to a swarm and what you can do to prevent swarming. Keep in mind that you may see a similar behaviour during an intense flow. 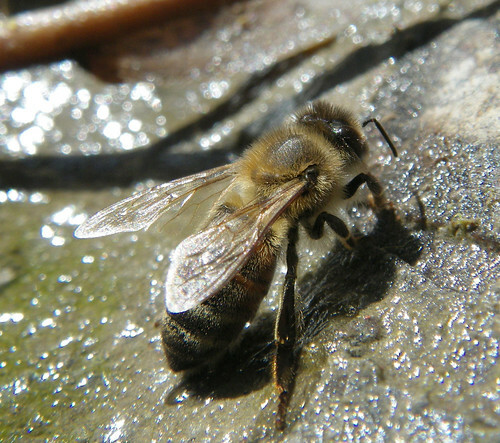 The bees may initially store nectar quickly in any available cell. They will then move it up above the brood shortly afterwards. So some nectar near brood isn't necessarily anything to worry about, but If they don't move it upwards, then you should expect queen cells are coming. Tips. You may also want to consider if there's anything you can do to help the bees cure the nectar into honey faster (As moisture is evaporated from nectar it requires less storage space). Many will tell you to increase upper ventilation during a flow, while a few might tell you otherwise. 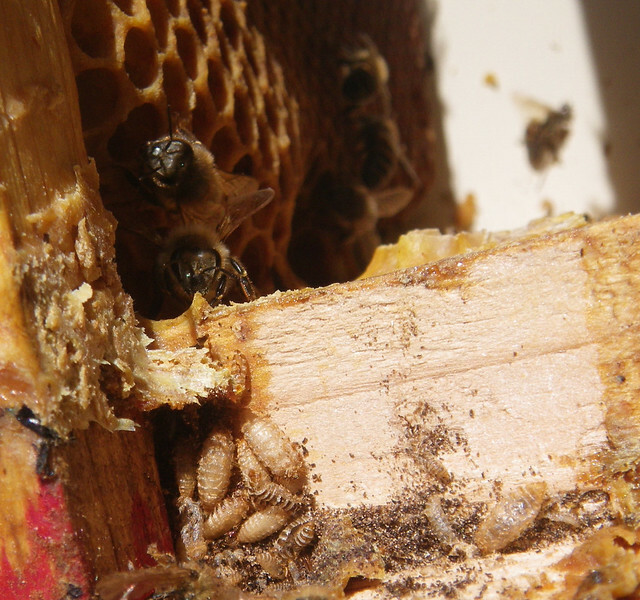 If the bees are backfilling during the reproductive swarm period, it is suggested to create space in the brood nest itself. 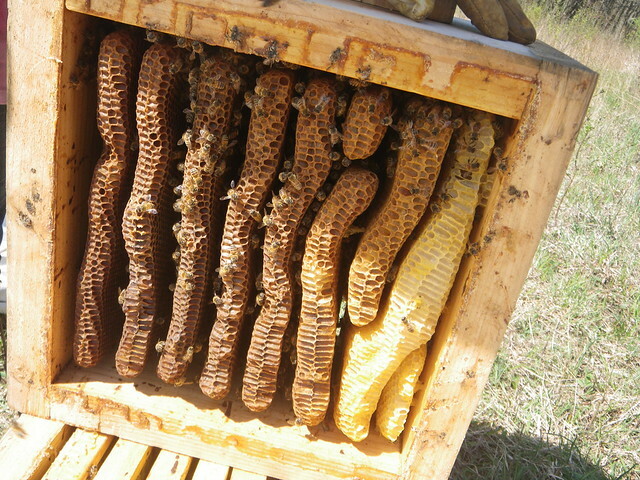 Simply adding honey supers may not be enough as the bees may need more brood space rather than honey space. 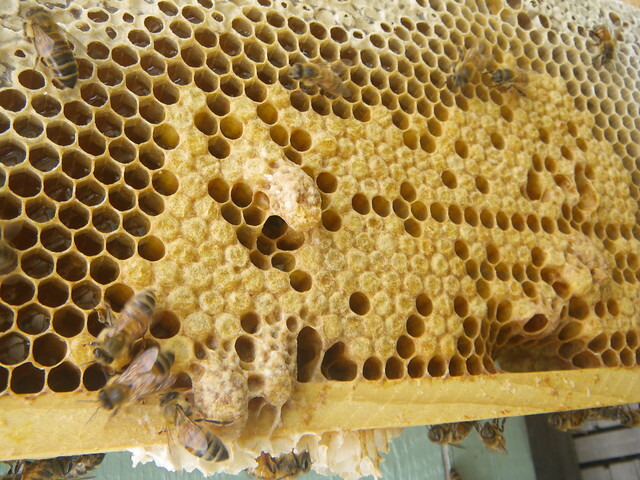 Once you see queen cells or eggs in queen cups, decide if they are swarm rather than supercedure cells. 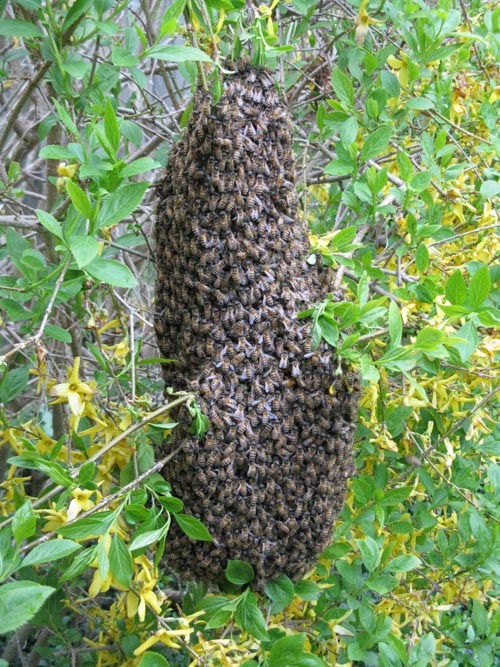 As I keep hives in urban areas where a swarm can be particularly unwelcome by neighbours, I tend to error on the side of caution and always assume it's a swarm cell. Caution. 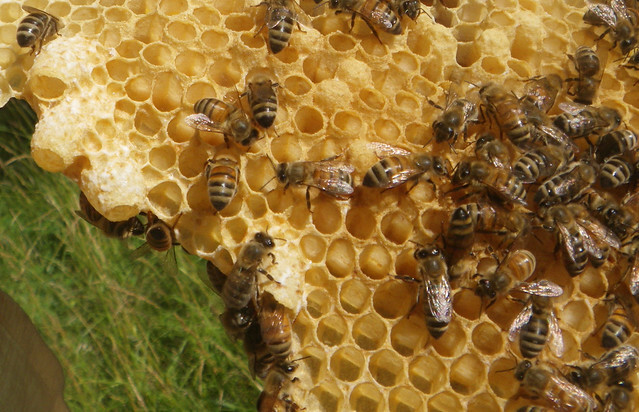 Once swarm cells are laid in, splitting, or artificial swarming, is the most effective recourse remaining to prevent a swarm. At this point it becomes extremely difficult to change the plans made by your colony by simply destroying cells and adding more space. The older the age of the developing queen the harder it will be to change the colonie's mind. 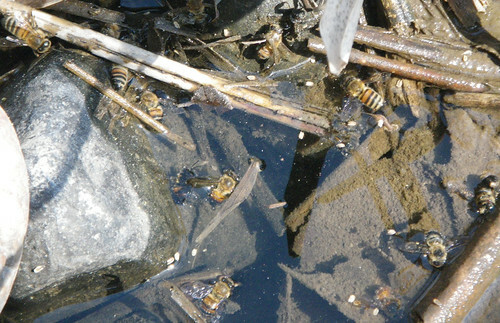 Early spring 2011 I walked right past the nesting grounds of what I now believe could be cellophane bees or colletes inaequalis. They were flying very rapidly around some loose sandy soil on a steep forest slope, so without taking a good look I just assumed they were flies. 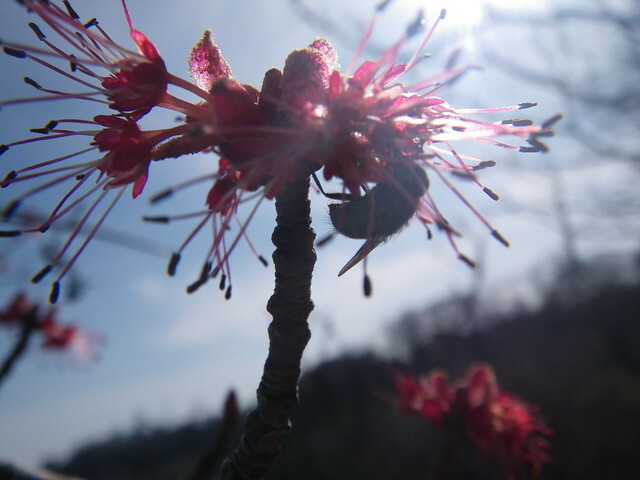 It was only when I looked at the blooms of the freeman maple standing at the top of the slope that I realized what was happening. As the first trees had started to bloom the entire hill side had suddenly sprung to life and I felt lucky that this marvel had not completely slipped past my attention. These bees are also known as mining bees. 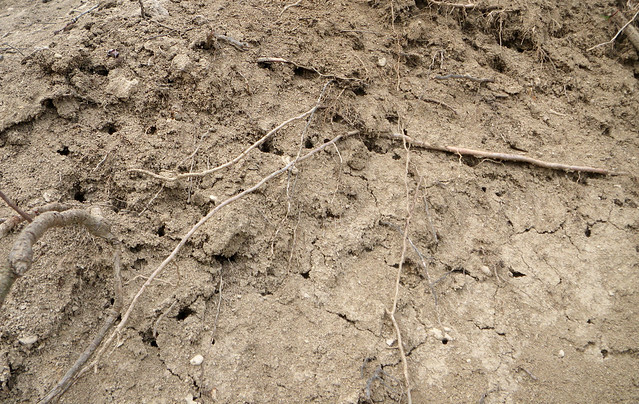 They are solitary bees which live in individual ground burrows, but many of these bees will set up home right along side each other. I left with a strong reminder to slow down and pay closer attention to the marvellous things happening in front of me.